View of “Pablo Dávila,” 2016. Pablo Dávila investigates our perceptions of space and time by translating the form of musical phasing across media. Phasing in music, which occurs when two instruments are played together at different tempos and so shift in and out of sync, is particularly associated with the minimalism of Steve Reich, whose score for “Piano Phase” Dávila visualizes in Ad libitum (piano phase) (all works 2016), a triptych of light boxes in which the notation itself blurs into and out of view. 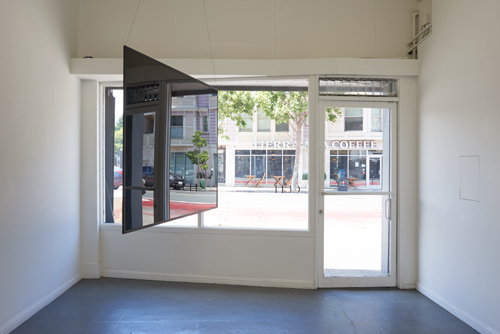 Dávila relates the theme of things growing more or less in focus in focus to ways we experience the passage of time—as in the nearly indiscernibly spinning sheet of black reflective acrylic, Prologue—also investigating three-dimensional space, as in the illusionistic volume created by a pane of glass and a projector in Oblique approach. As an analysis of phenomenology and subjectivity, “Ladies & Gentlemen, We Are Floating In Space” is astute and deeply meditative. But the show also harbors a subtle but powerful ideological critique (very much in the tradition of Latin American Conceptualism) of replacing our own sense perception with technological regulation. The most conspicuous and ambitious work on display, Living in time believing in the timeless, consists of a set of drumsticks and antique cymbals connected electronically to the UNIX timestamp code that drives digital clocks worldwide—and which is doomed to obsolesce in the coming decades. The percussion generated by this code is at first reminiscent of a singing bowl (Dávila references Tibetan Buddhism in another piece in the show), but visible at the back of the machine are wires and switches that feel feeble by comparison.